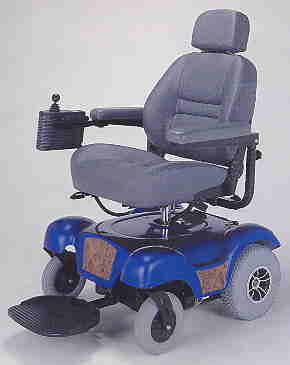 The Merits MP3CR Rear wheel drive - This state of the art rear wheel drive power wheelchair comes with a reclining back and very soft, comfortable padded upholstery. Frame is of durable steel construction and this chair has a 300 lb. weight capacity. Standard features include adjustable seat height, flip back arm rests that feature adjustable height and width and flip up footplate. Elevating leg rests are also available as an option. The MP3CR offers excellent maneuverability and durability indoors and outdoors!